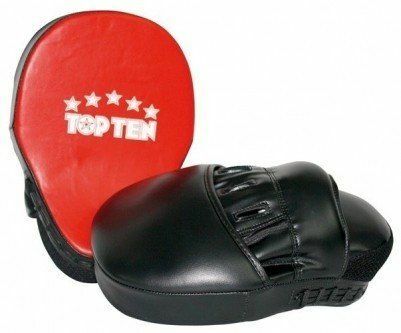 This innovative striking pad allows coaches to effortlessly act as an advancing or retreating opponent, putting pressure on the fighter or backing off, all without having to move your wrists and reposition yourself as you would with traditional focus mitts. Compared to traditional focus mitts or Thai pads, these punching targets allow more force to be absorbed through the body and help reduce strain on the pad holders wrists, hands and forearms. The new V2 version with thicker padding and additional strap. Curved focus mitts featuring carbon synthetic leather. Genuine leather with pre-shaped padding and contoured palm area to prevent slipping. Synthetic leather, specifically designed to fit smaller hands. Kicksports's entry level focus pads made with synthetic leather, comfortable and easy to put on and take off . Synthetic leather focus mitts with an additional rear padded area for extra hand protection. Made of genuine cowhide leather and Nubuk artificial leather. Synthetic leather ultra-lightweight curved focus mitts. Focus mitts are a great training tool for all combat sports which use punching, striking and kicking techniques. They can be used to improve your speed, accuracy, power and timing. Due to their manoeuvrability they are ideal for practising both attack and defensive combination drills both statically and on the move.